Stevie Ray Latham has seemingly been around for a while now and first crossed these paths with a set at Palmfest in Brighton a couple of years ago. Well now Stevie can be heard more extensively away from his South Eastern base with the eventual release of his debut album and MODERN ATTITUDES exemplary replicates the promise that was on display during the initial acquaintance. One man, his guitar, harmonica and a fistful of songs is a trusted and well-worn formula but Stevie brings something different to the table as he successfully blends the slightly aged in a style that acts as a bridge to his peers. That immediate first impression when listening to Stevie straight away will relate to the giants of his genre and while the similarities are abound, this record has far more substance than just a mere tribute project. MODERN ATTITUDES evolves into a raw reach out to the soul of acoustic folk blues with perpetual strains of both rough and worn elegance. All eleven self-penned tracks are explicitly driven and perfectly harness into a symbolic sound. They are beautifully constructed, while containing traces of basic tendencies alongside subtle sophistication. For a song writer with so much to say, it is hardly surprising that most of the songs are lyrically laden and at times the onslaught of almost alt-poetry challenges your aural senses. Yet persistence to tune into the wavelength of Stevie will pay off. A self-set target of avoiding any Dylan comparisons has sadly failed when it comes to defining ‘It Feels Alright’ and ‘It’s Been a Long Time’, but clichés apart, it’s not a bad thing especially when Stevie delivers both songs with such interpretive panache. The album also gets off to a flying start with the opening track ‘Get Out and Run’ immediately throwing an acoustic avalanche, vocal volley and timeless tirade into the mix. Occasionally, the relentless pace eases a little, such as in ‘Melissa’s Song’ and the emotive second track ‘Sunday Blues’. The latter shows a heartfelt side to Stevie’s writing and a fair stab at composing a memorable chorus. The title track ‘Modern Attitudes’ is another lyrical onslaught and lays down a marker for individual interpretation. Whether ‘South Coast Blues’ is autobiographical or not is in the mind of the writer but we all know slightly sad longing themes make the better songs. ‘I’ll Wait for Morning to Come’ is one of a number of tunes to be laced with a blast of harmonica to give the song a rich folk coating and give the listener a temporary pause from digesting the artillery fire of poetry and prose. For 42 minutes, Stevie Ray Latham will pound your senses with a barrage of legendary singer-song writing in a style quite unique from someone of his generation. 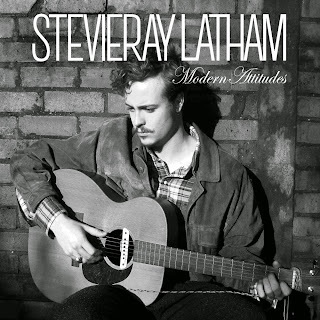 MODERN ATTITUDES takes its place as one of the year’s more unique records and announces Stevie Ray Latham as an artist not afraid to imitate, but also able to mould it into a modern vision.